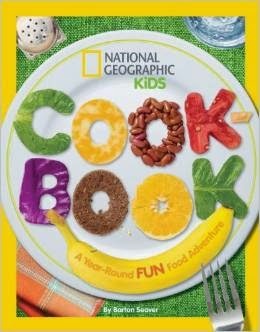 Top Notch Material: Book Review: National Geographic's Cook Books. Book Review: National Geographic's Cook Books. I love cook books. I can't help but browse each one I come across and more times than not, they end up on my shelf at home. Now that I'm a mom and meals are more important than ever before, I try to offer the best, healthy food I can to my family. It's funny how motherhood makes you second guess everything. For me, it's not just putting a well balanced meal on the table. It's about flavor, budget, health and planning smart. Every time I turn around there is an article, a new piece or television doctor throwing another food at me touting it's health benefits. It is all quite confusing. I searched, with disappointing results, for one resource that had each food listed with what it provided. That is why I really like the National Geographic cookbooks I received. National Geographic has dedicated this year to "The Future of Food," exploring issues surrounding how we eat today and we can provide food for all as the world's population grows. And, since National Geographic is a trusted company, I don't have to worry they are trying to sell me snake oil in the form of the latest fad fruit. Food for Health, breaks it down in an easy way to understand. It isn't your usual cook book, in as much as it doesn't really give you recipes. But it does make menu suggestions based on the season. 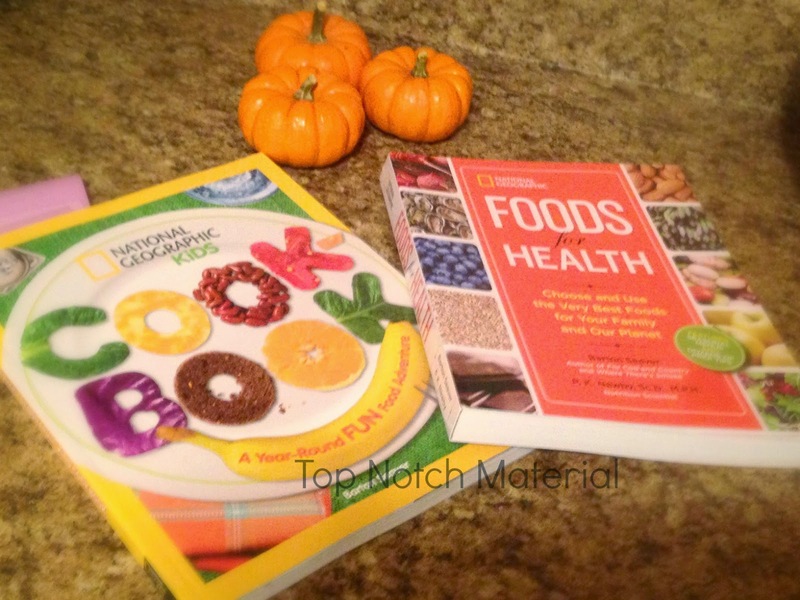 It helped to get me thinking of ways to bring seasonal produce into our meals. Seasonal produce will usually have the best price and flavor in addition to the health benefits being at their prime and is better for the planet when it doesn't have to be transported in from farther away. 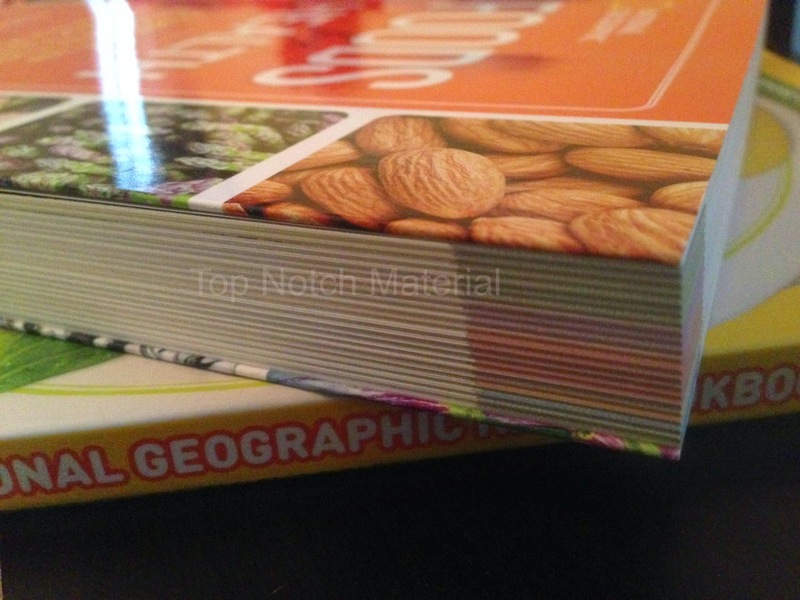 The authors of this National Geographics book, Barton Seaver and P.K. Newby, Sc. D., M.P.H., take an alphabetical and color coded approach with everything from produce to beverages; Produce, grains, proteins and more. I can't tell you how happy this makes my OCD self! 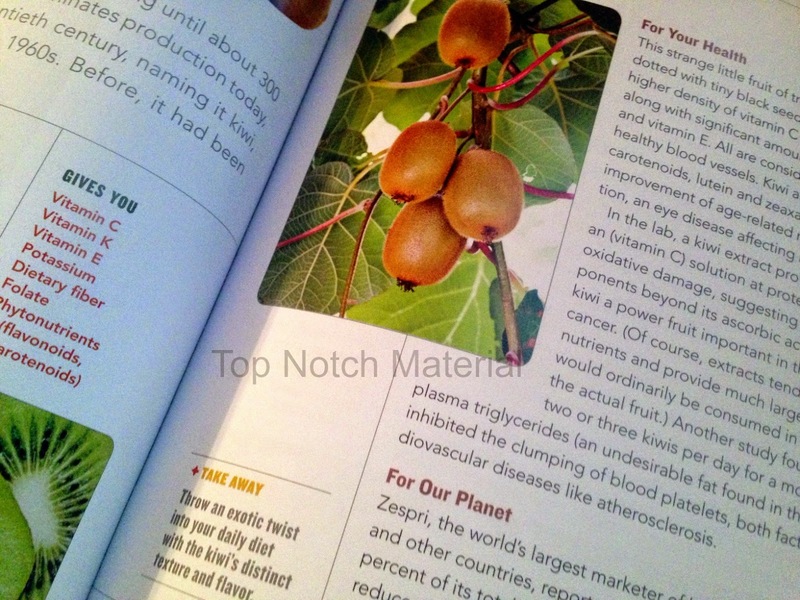 Each subject then is exploded to expound how to Choose and Use it, what vitamins and minerals it Gives You, explains how it is beneficial For Your Health and For Our Planet plus TIPS! And best of all? It's ALL IN ONE PLACE! Thank you, National Geographic! The second book I received is for kids. NG Kids Cook Book. My guys love to get in the kitchen with me so I'm always looking for recipes with steps easy enough for them to participate in. This books has loads of them. My favorite section of the book was about school lunches. My big guy, Little C started public school this year and he and I both insist that I pack his lunch. He enjoys my lunches so much he wants me to come be the lunch lady at school :). If you're like me, some evenings you look in the fridge or pantry and wonder what you can pull together for lunch. So I'm always looking for more inspiration. 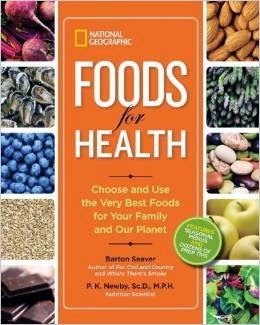 You can see the author of this book, Barton Seaver, talk about it here. This book is based on each month of the year and suggests a central focus. Of course the big holidays are designated to their respective months with suggested recipes and family projects. Then the book takes months with less obvious focuses as well. Let's look at August, ooooh because it's my birth month. heritages are given, like one contributor's Grandma's potato salad. 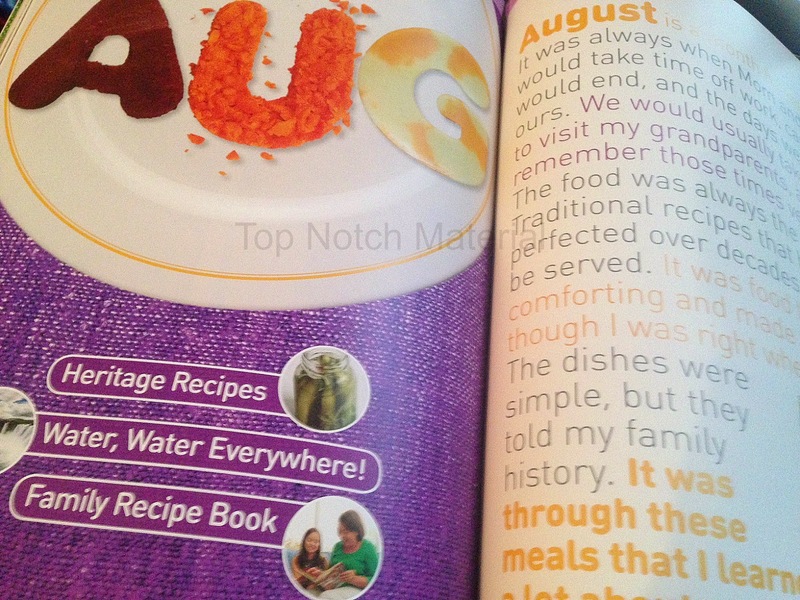 The family project is to make a family recipe book together. (I love love love this idea. I wish I would have gotten more of my Gramma's recipes before Alzheimer's made it impossible.) And the eco focus is water. Makes sense since summer is about outdoors and lots of trips to the beach. The book offers tips for water conservation, such as turning off the water when you brush your teeth and fix leaky faucets. Most parents know, if a kid can feel pride and ownership in a meal, they are more likely to eat. And it helps lay the foundation for healthy eating and family time for the future. Likewise, getting our children to think about our planet and it's resources at an early age will stick with them. Plus, have you ever given your child a job and they are quick to bust you? Years ago, Little C learned to turn the water off during tooth brushing. Now he's a little gestapo! I would recommend these books to any family. And our readers have a chance to win them below! I like that it covers art. My granddaughter would love that. Excited for them to learn Math! I'm looking forward to my child learning to read. I am very excited for my daughter to learn Reading! I started reading at a very young age and have always enjoyed it so much! I would like for them to learn math well. I am excited for my granddaughter to begin reading.